A few weeks ago we featured¬†the first African-American woman in space ‚Äì Mae Jemison. It is often the case that the person who is first to achieve something is the person who gets all the plaudits and¬†the second person becomes a footnote in history. In the case of the second African-American woman to travel into space this is a shame, as Stephanie Wilson has had an incredible career. Stephanie was born in Boston and her education was always focused on science. One of her assignments while in school was to interview a person who had an interesting career. Her choice was an astronomer. While at Harvard she earned her engineering science degree. She went on to get her master’s degree in aerospace engineering from the University of Texas. NASA‚Äôs Langley Research Centre sponsored her research work which studied the modelling and control of large, flexible space structures. In 1996 she was one of 35 Americans chosen (from a pool of 2,500 applicants) to begin training with NASA. Her initial training included becoming familiar with all the equipment they would be using. She also learned water and land survival and ejection seat training. After finishing the training one of her jobs was at Mission Control, where she was the main communicator with the on-board crews. 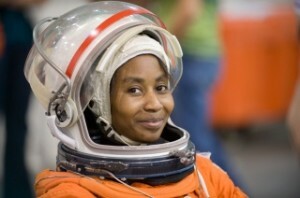 She went into space for the first time in 2006 on a trip to the International Space Station. On this trip the crew tested new equipment. The following year she returned to the Space Station, this time¬†delivering a new utility hub for the Station. Her third mission¬†in 2010 again involved bringing new equipment to the Space Station. Today she is still working for NASA supporting the International Space Station Operations Branch.